What’s wrong with this world? There seems to be so many broken things all around us. We see such destruction in the natural world with hurricanes and earthquakes. We see savagery in the animal kingdom when that wolf hunts the defenseless lamb and tears it to pieces. In the world of humanity, we see great evil in wars, sexual assault, child abuse, disease, and suffering. Much of the pain we see in the world can be traced back to mankind’s own rebellion against God. Adam’s sin in the garden “broke” the perfection in Eden, and the entire planet has gone downhill ever since. Doesn’t God even care? God does indeed care. He sent His Son to deal with the root of the problem, our sin. God is patiently giving people a chance to turn to Him to find the healing from brokenness that only He can give. Best of all, Jesus will one day return and fix all this mess. 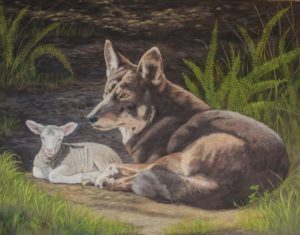 Isaiah described what a “fixed” world would look like: “The wolf also shall dwell with the lamb, the leopard shall lie down with the young goat, the calf and the young lion and the fatling together; and a little child shall lead them” (Isaiah 11:6). Do you need the “Fixer”?